It is so tempting to make a call that the market sentiments are getting better isn't it? But before you start declaring so, the market turns downwards the next day again. Day and day, you wait to make the call that indeed things are getting better. Has the day arrived when you can claim victory? The answer is obviously no. The market has almost given up gains obtained on Monday and Tuesday in the last 2 trading days. We know very well that Greece elections is scheduled on 16 June; Spain has been a huge drag on the EU under the shadows of Greece while Italy has seemingly gained some better foothold of its debts; China has been slowing down albeit insufficiently to warrant a timely stimulus that has been on the mouth of many lately. Nothing has changed today as it has 4 weeks again hasn't it? The STI chart speaks almost the same language as the Dow weekly chart as I have posted a few days earlier. MACD - charging downwards with little inclination that it will be changing direction anytime soon. 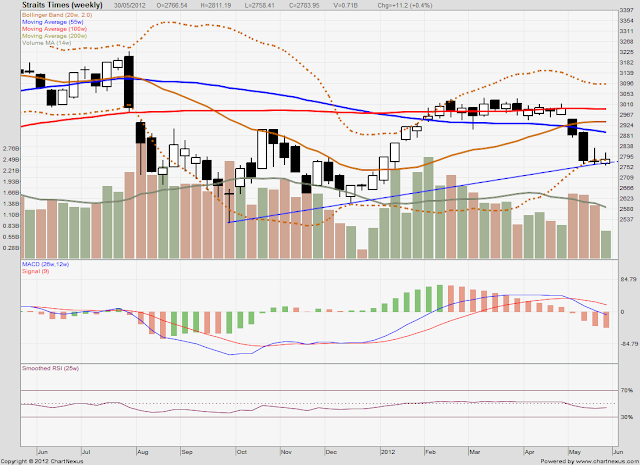 In fact, MACD has just started going below 0 and there is much more room possibly for downward movement. Bollinger bands - latest weekly price is still resting nicely on the lower bollinger bands that suggest a possibility of a short term rebound as discussed in the Dow chart 4 days earlier. Prices are also well supported by a major support line. Technically, there is good evidence pointing to a short term rebound in prices but an overall continuation of the drag in investors sentiment in weeks to come. The problem here has not been the confusion of technical indicators but the internal emotions that drive our judgement. The facts are present to tell us not to trade unless we can make a quick bet and get out of the market. Then we succumb to greed and stick a while longer.